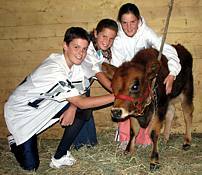 Fall 2005 ~ BAMBI, a mini Jersey heifer, was safely transported literally from coast to coast by Worley's Hauling. Being the nervous new owner, I was worried about the winter weather , but all the way was given updates and reports on our precious calf. Being a veterinarian, I was also worried that a newly weaned heifer might not do well away from other cows on a trip from New York to CA. We called many companies , but after speaking with Mari and learning how they take care of their clients along the way, I had no hesitation and booked the trip. Thank you again for loving our pet as much as we do. Jan.2006 ~ FROTO ~ I wanted to say thank you for taking such good care of "Froto" from VA to CA. He arrived safe and in wonderful condition. When he had a colic scare, the Worleys stayed up all night with him to make sure he was safe and sound. I couldn't have asked for better haulers. I received constant updates and would recommend your company to all who need a safe and reliable transporter! Mar.2006 ~ 3FS MIDNIGHT STORM EDITION ~ Hey Bill & Mari, Just want to say thanks for the great job you all did for me in getting my new stallion 3FS Midnight Storm Edition to me. Bill was very nice and seems like he really has an interest in seeing that the horses arrive safe and sound. Thanks for staying in contact with me about his arrival. I will highly recommend your service not only for the good and timely service, but also for your reasonable rates. I've included a pictures of my sweet chihuahua they hauled for me from Kentucky. 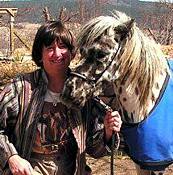 Mar.2006 ~ Thank you to Bill and Mari for transporting Toyland Spotted Eagle. 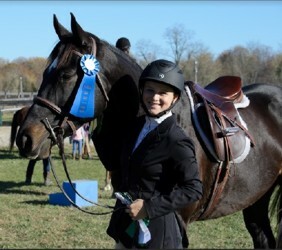 I was impressed with your professionalism and great care for the horses! I really liked how you kept in touch with me and let me know how Eagle did on the trip. Next time, I will call Worley’s Hauling FIRST for the best in horse transportation. May 2006 ~ ART DECO DIVA ~ Thank you Worley's for taking such great care of my Diva, and for offering an open spot for her on such short term notice! Your prices are very affordable and your quality of work will definitely bring me back in the future! 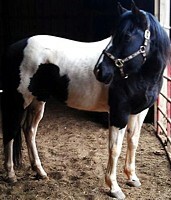 Thank you so much for helping to bring Diva home, she is everything I had hoped for and more! Dec. 2006 ~ LAILA ~ Thank you for delivering Laila to me (from NC to OH). It was great to know she was in very good hands and being treated well. Laila arrived happy, healthy, safe and sound. What more can one ask for? I will recommend you to all who have future transport needs. ~ Thanks for my early Christmas present! 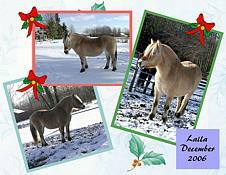 Dec. 2006 ~ CALYPSO and DELIGHT ~ Thank you, Mari and Bill, for bringing our long awaited leopard colt, Calypso, to us! We had a very long wait after he had gotten sick as a baby. 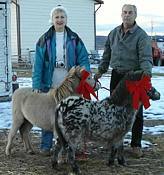 So it was extra special, to have him step off the trailer with his traveling pal, Delight , during the Christmas season, with bright red bows!! Thanks too for taking good care of him for the two weeks in Kentucky..... helping him to transition from Florida weather to Wyoming winter! You kept us posted all along! And we'll be sure to call you again when we need transport!! 2006 ~ BULL ~ Earlier last year you brought us a little driving gelding, Bull, from Amish country - complete with his Amish built cart and harness. He also arrived very settled. I don't hesitate to recommend you to anyone I know. As far as I am concerned, Worley's Hauling IS the best in the business. Thanks again Bill and Mari for another job well done. Dec.2006 ~ SHANE and STOWE ~ I'd like to thank you for the last two trips you have made for me. In all, you have delivered 11 horses to me over the last 2 years. All have arrived absolutely stress free. 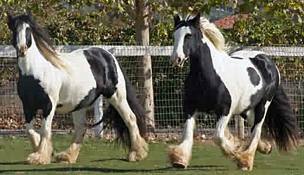 The most recent delivery (12/06) was our two Gypsy Vanner Horse mares -- Shane (9 months in foal) and Stowe (8 months in foal). Obviously we would NOT trust these extremely valuable and rare creatures to just anyone. 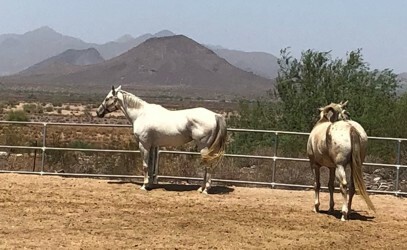 When these girls walked off the trailer after 7 days on the road from Santa Ynez, California to Monroe, North Carolina, you would have thought they had been on a day trip. They were calm, cool and collected thanks to your expert handling. June, 2007 Worley's Hauling did a great job transporting my horse from Kentucky to California. They kept in touch with me and I knew exactly where my horse was and how she was doing throughout the trip. Delivery was on time, just like they said. It was a pleasure working with them. Thanks again, you make a wonderful team! Another wonderful shipping experience- thank you! You kept me informed regularly and mare and foal were comfortable. Thanks!!! Here are my new babies that Mari n Bill Worley Hauling brought here! Thanks again for another job well done!! Thanks again for delivering Mini Pearl to us. Since she's a dwarf, we were concerned about her being on a long trip from VA to AZ, but she arrived safe, sound and happy. We wish we had known about you when we adopted our first special boy 4 years ago. After you delivered our driving miniature last year, we knew Mini Pearl would be in safe hands. She's made fast friends with our other dwarf girl and we couldn't be more thrilled. We will call you again when we're needed to adopt another special wee one. I would like to thank Mari and Bill Worley for how they helped me out getting my precious cargo home to me! Sunny had been in Texas for a year and suddenly had to come home to Arizona. Thank you Bill for taking such good care of her on her long trip home and keeping in touch with me and thank you Mari for keeping me posted and both of you for all you did! If I EVER need another horse transported I will only call you guys! Robin and Docs Only Dream "Sunny"
Just a quick note to show you how nice Blue looks the day after his arrival in Salem. He walked off the trailer calmly but still had enough energy to rip around the arena for a while to blow off the steam of transit. Thanks so very much to both of you, Mari and Bill. This is my first transport of this distance, (Moorhead MN to Salem OR) and it was worry free. I'd be happy to provide a reference for you at any time. And finally, a bow to say thanks. Okay, he's not really bowing, he's stuffing his face under the fence to reach the grass, but I can pretend, LOL. It's cute enough that I have decided I will have to teach him to bow. Thank you for delivering our Arabians, Romeo and Juliet, to our new home. We had worried about how they would do on the long trip from California to Texas. But they arrived relaxed, healthy, and happy. Thanks also for the excellent communication, both on the internet setting up the trip and on the phone during the trip letting me know how the horses were doing. 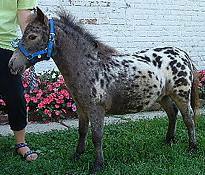 I have recommended you to friends and will use you again when it is time to have my baby Warlander horse sent to me from Washington. 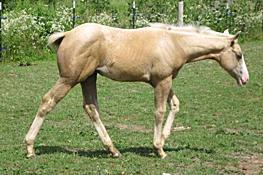 Worley brought him to me as a foal 4mos.old. The care and experience shows. Aslan was perfect. Thanks so much for another excellent shipping experience. 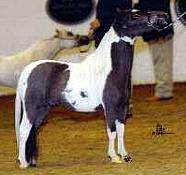 I was concerned about shipping Ardeo, my weanling Warlander (Andalusian/Friesian), from Washington state to Texas, as it was such a long trip for such a young guy. 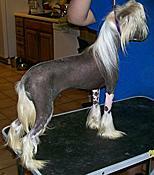 But just like before when you shipped my 2 Arabs from CA to TX, he arrived calm, healthy, and happy. Even when I looked at him on the trailer before unloading him he was totally relaxed, just like travelling cross country was a regular thing. Thanks also for the excellent communication, answering all my questions promptly. 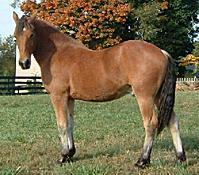 Should I ever need to ship another horse cross country you will be the one I call. 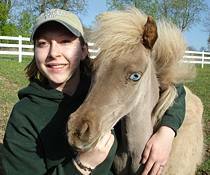 This is a picture of Muggur the Icelandic Horse that your wonderful husband brought in January! 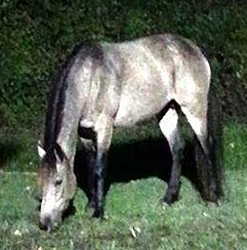 He is doing well and has settled in with his pasture mates. You guys did a wonderful job getting him here! 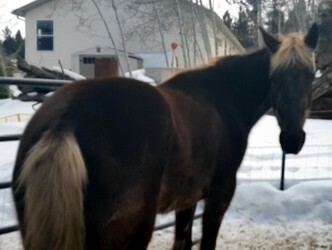 Bill had some problems with Muggur with eating, drinking, and the weather but he made it through everything with the utmost care and consideration taken for the horses. It was an above and beyond effort on both of your parts. Thank you again for making my horse's trip across the country as pleasant as possible! Mission accomplished! 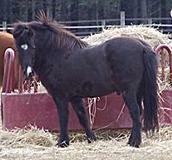 As you can see 'Pokey' the little black one did not want to unload. We had to push her the whole way to the barn! :) But, they are here, and thank you very much. I REALLY think this time will be my last. I have 12 here now.....one is sold.....my barn is overflowing! 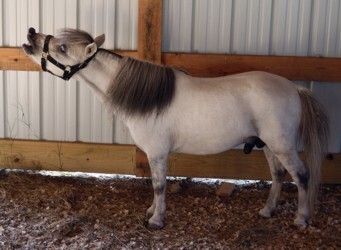 Here is Baby at her new home. She has already made a new friend Tyler (standing next to her in the photo). Thumbs up to WORLEY'S HAULING for taking care of our old girl. 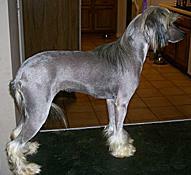 She arrived in great shape and Mari kept us posted every step of the way and treated her like their very own. Thank you so so much for bringing me my Elvis. The whole experience with you has been fantastic from day 1. 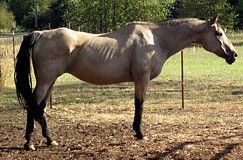 I will highly recommend you to everyone I know or meet that needs their horses moved. I wouldn't ever use another company! Thanks for the great experience! them! P.S. 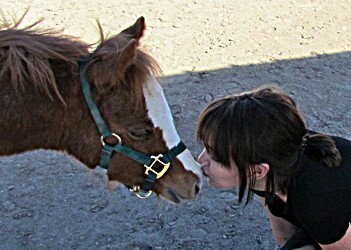 he still likes peppermints. Hi Mari, I hope this finds yourself and Bill well. Just wanted to thank you two for the excellent service you provided us. Your pick up and arrival dates were as promised, Thank you for being flexible on this end keeping them for us while our things arrived. 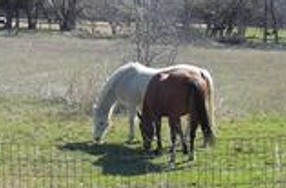 The horses are doing great and settled in their new pasture just fine. Would highly recommend your services to all. Thanks for bringing him home! 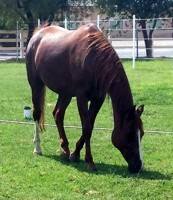 Thank you for taking such good care of Turbo during your recent transport of him from California to Texas. You have gone above and beyond the level of service that I expected. I appreciate so much your updates throughout the trip, stopping for more feed, for giving him love, scratches and carrots throughout. AND for delivering my precious horse safely and healthy. He arrived happy and relaxed... I am happy to recommend Worley's Hauling and you are on the top of my list for transport next time! You and Bill are the BEST! I just wanted to thank you for delivering my boy safely to the beaches of sunny Florida. I was very concerned about such a long trip since he has some special needs, but he showed up in the exact same condition he left in even after crossing the country! Being that we are a military family, we'll be moving again and there is no one else that I'll be using to ship my Izzy. Thank you very much for delivering the 3 minis to me and unloading them for me, and even taking the time with the baby. She got her first lesson from you. I was surprised at how much calmer she was by the time you had put her in the pen. I just wanted to let you know you did a super job and I appreciate it. You would never know that they had traveled from so far. They settled right in. Thank you. 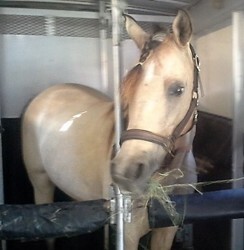 Here's my special new TWH mare, Sunny, during her first few minutes after being unloaded to her new home. She's happily grazing -- an excellent sign that she had a wonderful shipping experience, from Chelsea, OK to Hampton, VA with Worley's Hauling. 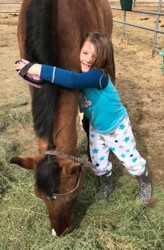 The Worley's went so far out of their way to take care of my six year old baby girl, who hadn't left her farm in about 4 years, before being shipped so far away. I would recommend the Worley's to everyone I know, and certainly call on them first, should I ever need equine transport again. Mari & Bill, thank you seems like such meager words, considering my relief and gratitude for getting Sunny here as quickly and safely as possible - you guys are the greatest! Thank you for getting my high maintenance hot tempered Hanoverian 3000 miles through snow, ice and rain! Thank you so much,He was so clean and looked so good. that was a long trip for any horse and you all are such nice people.and took such good care of Jakarta, here is a picture of him Happy to be home. I just wanted to send a Thank you! To you and Bill, for all the hard work and care you put in to getting our Scottish Highland cows cross country to our home They are happy, settling in great and didn't look like they had a four day trip at all...a wonderful experience with you both and we would love to haul again with you guys in the future...in the most simple words I can think of...You guys are the BEST!! No one else would have taken such good care of our cows. I recently had Worley's haul my new 4 yo from California to Delaware...Mari and Bill are exceptional haulers. Their quote was well below others,customer service was EXCEPTIONAL, I was kept notified throughout the 6 day journey and my horse arrived very happy, healthy and safe. I have used other transporters in the past but if I ever need transport again...Worley's will be the company I call. I am so happy with everything about my experience!! "Worley's Hauling is AMAZING! 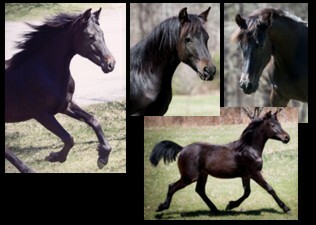 They transported my 11 month old Friesian Sport Horse colt, Noble, from California to New Hampshire with ease. 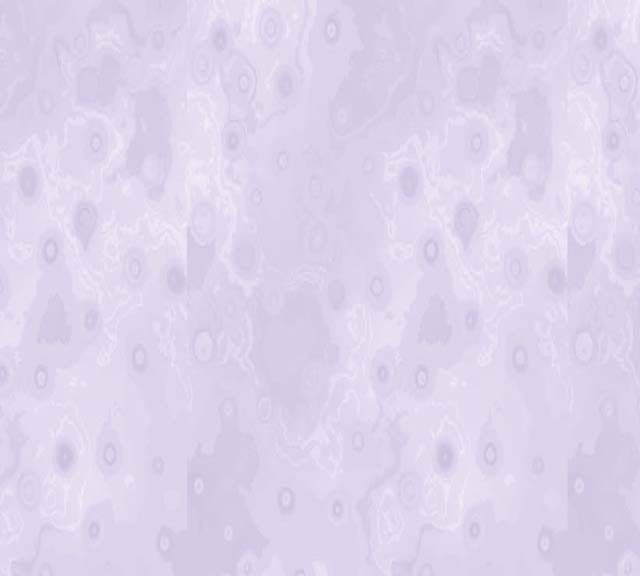 He arrived on schedule, calm and content. 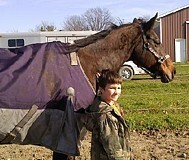 The trailer was clean and my colt clearly trusted and adored Bill. Throughout the trip Mari kept me in the loop on how my baby was doing. I couldn't recommend Worley's Hauling more. Without question, I will use Worley's Hauling again. Not only do they care about the animals they haul as if they were their own, they care about their human parents too! 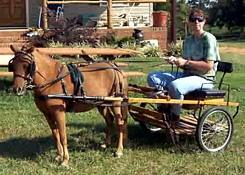 If you are looking to transport your animal big or small, young or old, I can't imagine anyone better for the job. Thank you for taking such great care of my baby"
Bill with his buddy Tucker! Glory decided it was a good time to roll. 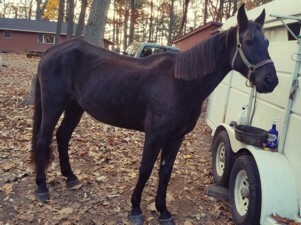 Worley's Hauling picked up my 11 year old Peruvian Horse on November 7th 2016 in Texas and had him to Southern West Virginia by November 9th 2016. I was very pleased with the care he got while he was on his trip and how easy they were to talk with and keep me updated. Mateo and I have already been hitting the West Virginia trails thanks to Worley's Hauling for getting him to me so quickly. He was not stressed at all from the 1200 mile haul. 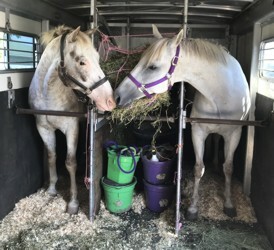 "Thank you, Bill and Mari, for safely hauling our rescued gelding "Moonshine" over 1000 miles from Mississippi to Maryland. 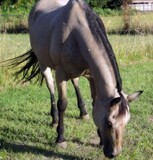 He arrived happy and content at his new home and has been steadily gaining weight!" Cannot Thank Worleys Hauling enough, Bill brought me two goat doe's, one from FL and the other from TX all the way to CA and they where perfectly taken care of, clean trailer, well fed and watered, the doe's had a nice comfy ride all the way to Cali. Great quick responses too! Thank you Thank you, and super reasonable rates as well!! will definitely use again. 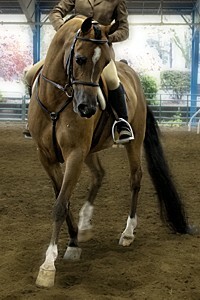 Worley’s Hauling did a great job moving our OTTB from Maryland to Oregon. Their pricing is very competitive. They are professional and thorough from keeping us up to date when weather affected the schedule for safety concerns, to making sure the pickup and drop off were as easy as possible. They stayed in touch. We got updates from the road and our guy showed up in good condition. Bill, our driver, was a gentleman and cares about his cargo as well as his customers. We recommend Worley’s without reservation. 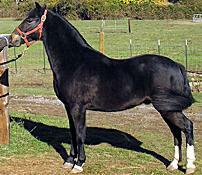 I just received my Kentucky Mountain mare yesterday. Bill of Worley's Hauling did a superb job of taking care of her on a 4 day trip. He stopped at night so Latte could get out of the trailer and rest up and move around. 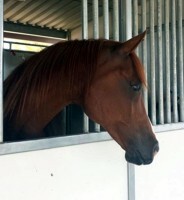 Her stall in the trailer was very clean and she arrived healthy and in great shape. I cannot praise this company enough. 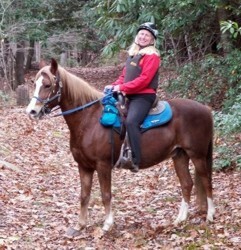 Mari and Bill assured me that my horse would be taken care of , and they went above and beyond that assurance. The price? Very reasonable. 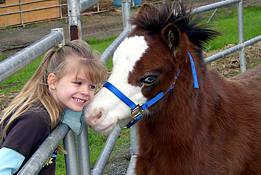 They also give discounts to rescue horses being hauled and to the military. THANK YOU. Worley's Hauling.....you are a 10 in my book!! I wanted to share a few pictures of Shea’s journey from Florida to Arizona. The first one is right after she loaded in Florida, and the second is Shea’s homecoming and meeting her new barn buddie, Kidd. 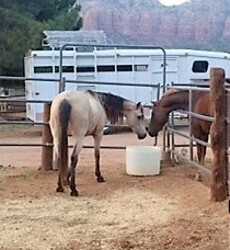 I can’t thank both of you enough for transporting Shea to her new home here in Sedona. I know you’ve probably heard this from many clients, but this being my first time going through moving my horse, I relied on trust and faith that you two would make sure she arrived safe, healthy, and happy!! Everyone at the barn was amazed at how well she transitioned into her new setting, and I know that was due to how well she was treated and cared for on her journey. It was a pleasure having both of you involved in setting up our new home here. I would highly recommend your services. You both exceeded my expectations! Wonderful job. Great at communication and put my babies safety first. Arrived at a good weight and no injuries. Can't thank you enough for all your communication! Horses are doing great.